The small island of Panglao in the Philippines is a tranquil place that is hard to tear yourself away from. After a few days of pleasant idling, you hire a car and head over the bridge to the neighbouring giant island of Bohol. As you pass through lush, but flat terrain peppered with bamboo and palm fibre huts, you drift into a beautiful reverie of bygone tropical times. Panglao is surprisingly verdant for an island named after the limestone and thin soil layer that makes agriculture so difficult here. After a short while, you pass through the mangroves of Dauis on the eastern edge of Panglao. As you come to the bridge, you pass the La Señora de la Asuncion (Our Lady of Assumption) Parish Church. 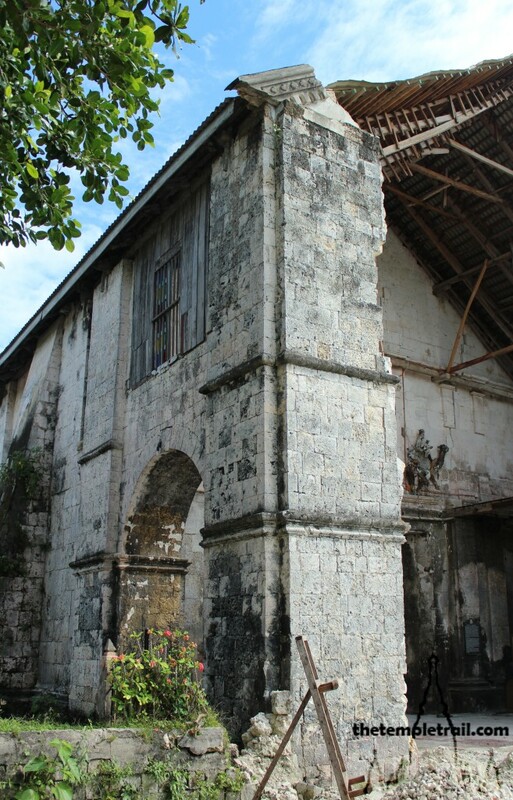 The small church built in 18th century is an indicator of what awaits you on Bohol; still reeling from the 7.2 magnitude earthquake that rocked the islands in October 2013. 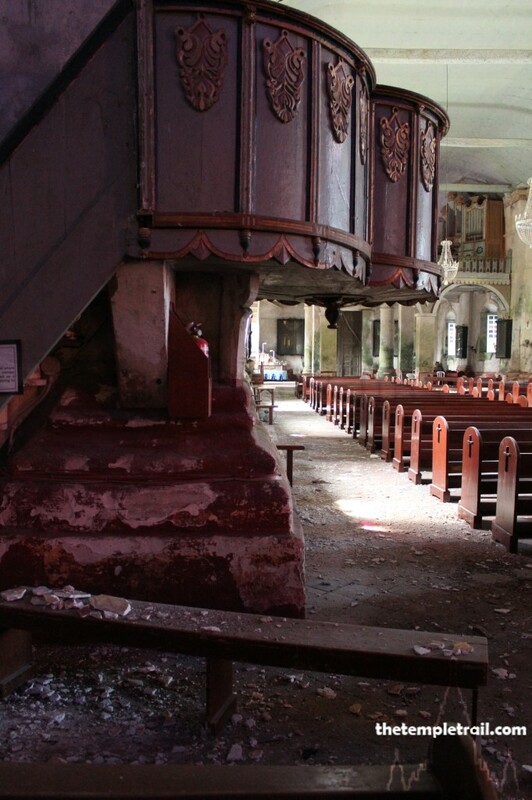 The front of the church is a sad sight and has crumbled under the powerful tremors. You zip by the church on your way to another. Ten minutes later, you are standing before the huge stone church of Baclayon, once more lamenting the awful potency of nature’s fury. La Iglesia de la Inmaculada Concepción de la Virgen Maria (Church of the Immaculate Conception of the Blessed Virgin Mary), as it is more formally known, is one of the glorious stone churches of Bohol. 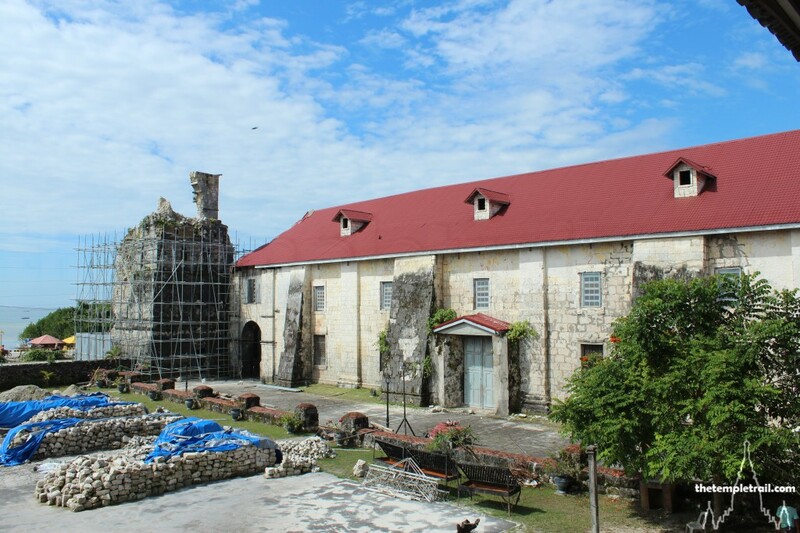 The island has a rich church heritage that traces its roots to the sandugo (blood compact) between the Spanish explorer Miguel López de Legazpi and local chief Datu Sikatuna. The compact paved the way for Christianity and the building of churches all over the island was sanctioned. 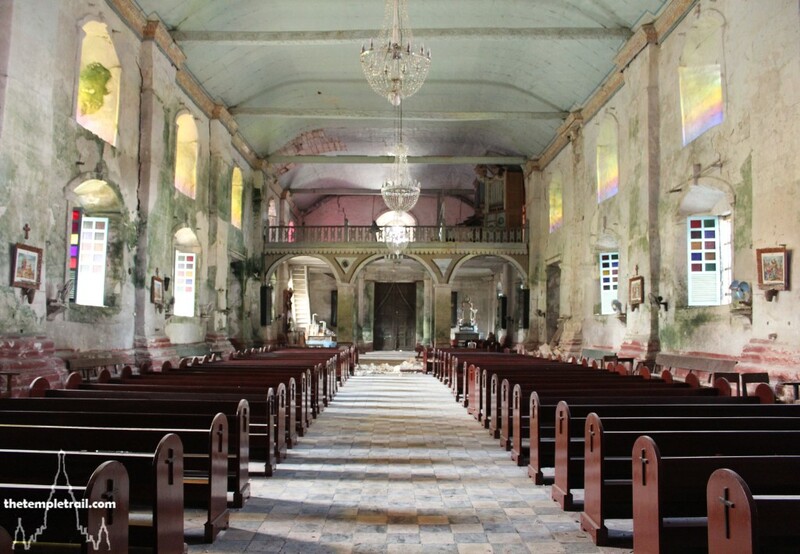 The church at Baclayon is one of the oldest and was originally founded in 1595 by Fra. Juan de Torres and Fra. Gabriel Sanchez. These two doctrineros (missionaries) from the Jesuit Order found the area to be in an unsatisfactory state for the purpose of worship. Torres, the more influential of the pair, roped the locals into constructing a visita (chapel-of-ease). The small church made of bamboo and thatch was used by the Jesuits until they fled to Loboc in the aftermath of an attack by 300 Moro (Muslim) marauders from Maguindanao to the south in 1600. 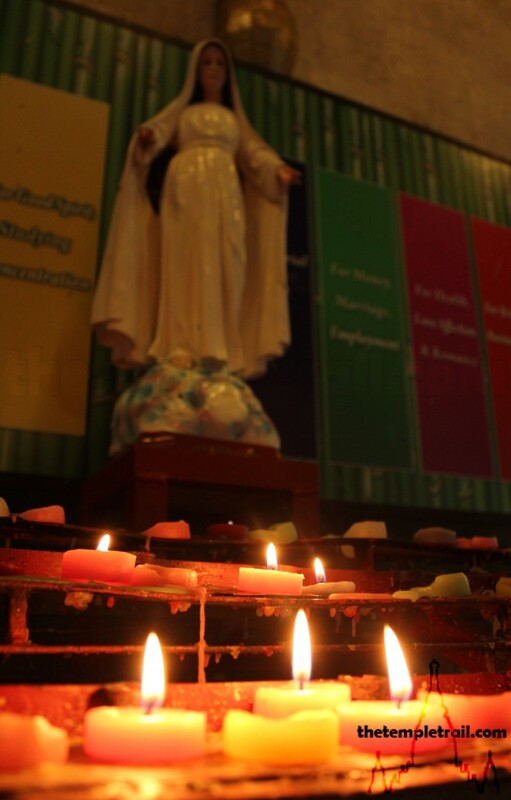 Locals maintained their faith and did not join with the other Boholanos during the Tamblot Uprising of 1621. Tamblot, a local babaylan (shaman), incurred the wrath of the Spaniards after besting the Jesuits in a challenge between their God and the local god; Ay Sono. As retribution, the Spaniards raided Tamblot’s camp and stole silver and gold. This started a rebellion that was quashed by the Spanish and Cebuano forces. One local story tells of Tamblot being assassinated by priests from Loboc, although there is no record of this. After the crushing of the uprising, the locals easily converted to Catholicism and they remain among the most devout followers to this day. The local religion actually made this transition easier, as beliefs in the first man, the flood, paradise, and punishment after death already existed. Their religion was actually similar in many ways to the new religion brought by the Jesuits. 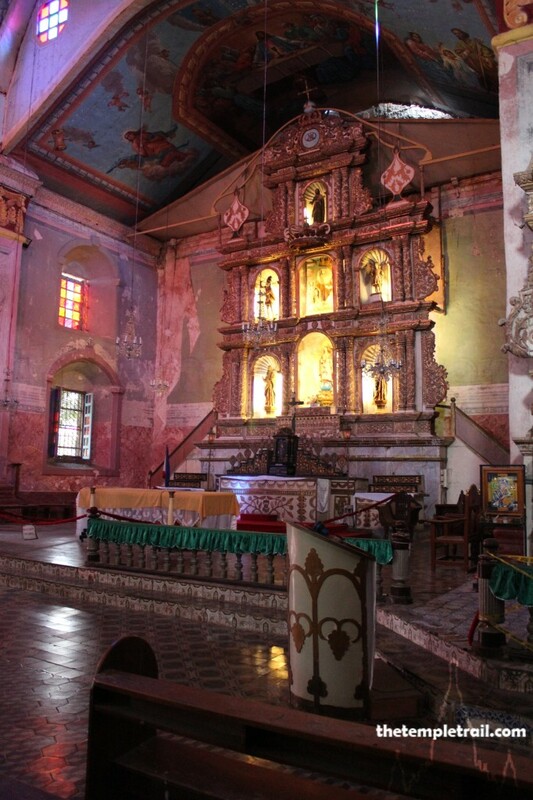 Despite no longer being the seat of the Jesuit Order, Baclayon remained important and was declared a parish in 1717. 200 locals were forced into labour by the Jesuits to begin the construction of the stone church that was completed in 1727. It was upon completion that the church was assigned its first permanent priest, Fra. Joseph Berengue, who was stationed at Baclayon for 51 years, making him the longest serving in the history of Baclayon. He was also the only Jesuit, as the Society of Jesus was banished from Spain and all of her territories in 1768. The Jesuits, who were hard task masters that suppressed the native population, were out and the area was handed over to the Augustinian Recollects, a contemplative order. During this handover, the island was in the throes of the second rebellion, The Dagohoy Rebellion, which lasted from 1744 until 1829. This was once more a reprisal against the Jesuit priesthood of Bohol. Between 1727 and 1898, Baclayon had 18 Spanish priests. It was in 1898 that the Spanish–American War determined that the Philippines be handed over to the USA. The first Filipino priest, Reverend Juan Villamor took over Baclayon Church and the line of Filipino priests has remained unbroken to this day. Standing before the church, your heart becomes heavy as you view the remains of what was once the tower and façade of the church. The earthquake made itself known strongly here. The ruined front now lies in small piles as the workmen begin the process of rebuilding the once magnificent structure. Both the tower and the façade were built under the administration of the Augustinian Recollects. The bell tower, started before their arrival, was completed in 1777 and dedicated to St Andrew in honour of the parish priest of the time, Fr. Andres de Santissima Trinidad. The tower served a dual purpose. Looking at the crumbling tower, you note its thick, fortified walls. These tell you that it was also a watch tower and defensive building to protect against Moro raiders. Before you the once square stone walls have been unclad and the top tier completely destroyed. This level held the bell that was installed in 1835. 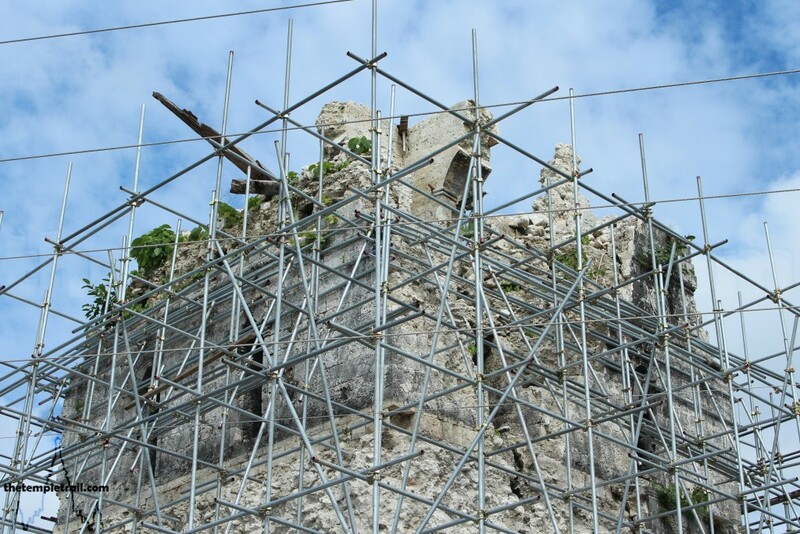 Continuing past the tower and its nest of scaffolding, you find yourself before the façade. The Recollects commissioned it in the 19th century and the grand frontage had, until 2013, three archways, each topped with a shrine holding a saint. Now, one solitary arch greets you and its glass encased saint looks forlornly out at you. 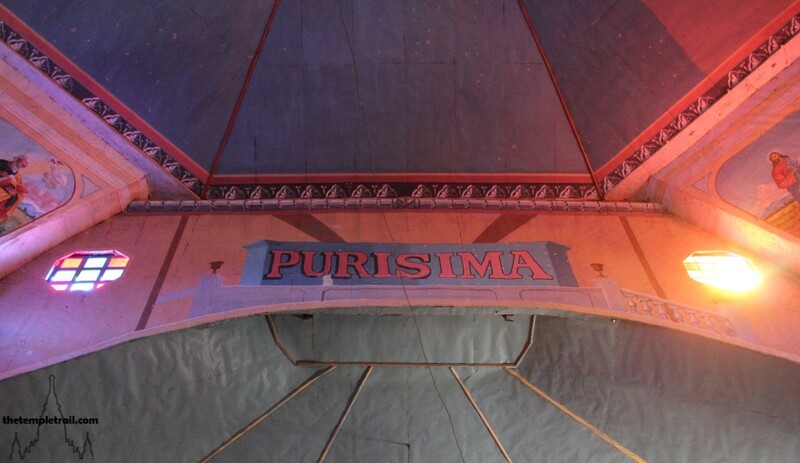 Stepping into the portico, you look up at the corrugated iron roof that now sits exposed to the daylight. The 19th century improvements included a series of other stone buildings that replaced the earlier, more defensive ones built by the Jesuits. The original construction was done by more than 200 native workers who were forced into labour by the Jesuit brothers. They dragged coral blocks from the sea and, using nothing more than bamboo and brute strength, built the core of the church from these cut blocks, sand and egg whites. It is said that over a million eggs were used to make the mortar. Apart from the original façade, that you now see exposed by the earthquake, they also had stables, fortifications and a dungeon built. These not only defended from invaders from outside, but dissenters from within. The portico façade added by the Recollects was in tune with the fashion of the time and served to de-escalate the more military feel of the church. You walk through an arch on the right of the portico and walk along the side of the main church building. The buttresses that hold the walls up served to save the church from being totally destroyed. As you walk along, you ponder this fact. 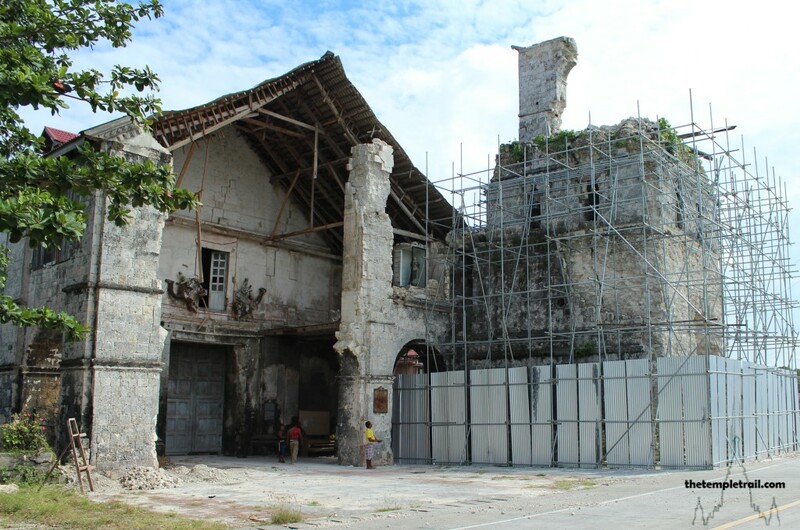 It is almost miraculous that Baclayon only lost its façade and bell tower while the churches in nearby Loon and Loboc were raised to the ground. As you come to the end of the wall and work your way over to the entrance and vestibule of the church, you look back at the wall. From here, you see what devotees believe to be a miraculous image in the stone of the wall. Looking at the buttress nearest to the tower, you see the stone is darkened in places. It appears to make the image of a face. Many have stated this to be the face of the Italian monk and stigmatic, the now canonized Padre Pio of Pietrelcina. The Capuchin priest, who passed away in 1968, was said to have a whole raft of miraculous powers and is a hugely popular figure. His body rests in San Giovanni Rotondo in Italy and is incorruptible. Looking at the image, you note the resemblance, but wonder why he would show himself here. Before entering the vestibule, you look over at the former convent. Now a school, the building was extended in 1872 using the coral from the Jesuit defensive wall. The wooden balconies reflect a colonial style that could place you in any Spanish influenced country in the world. Children look down at you from the second floor as you walk into the shady vestibule. Before heading into the church, you climb the rickety stairs that take you up to the museum. The creaking floorboards hold statues and other items once held in the church, but now kept here for safety reasons. Statues such as an ivory Christ are kept along with relics of St. Ignatius of Loyola, founder of the Jesuits, and paintings by famed 19th century Filipino artist Liberato Gatchalian. Returning to ground level, you turn into the passage on your right. The lichen and damp of the stone corridor are illuminated by a rack of candles in front of a statue of the Virgin. The colour-coded wax is explained on the wall and you select a candle to light and a wish to ask for before slipping a few pesos in the collection box. From the corridor, you enter into the ante-sacristy at its terminus. The small chamber is filled with various statues that are brought out on the feast days of the saints they represent. A small statue of Padre Pio also stands in the chamber next to a collection box for the church restoration. After inspecting the various images, you go through the simple sacristy and out into the main part of the church. The lighting changes subtly as you step into the sanctuary area. 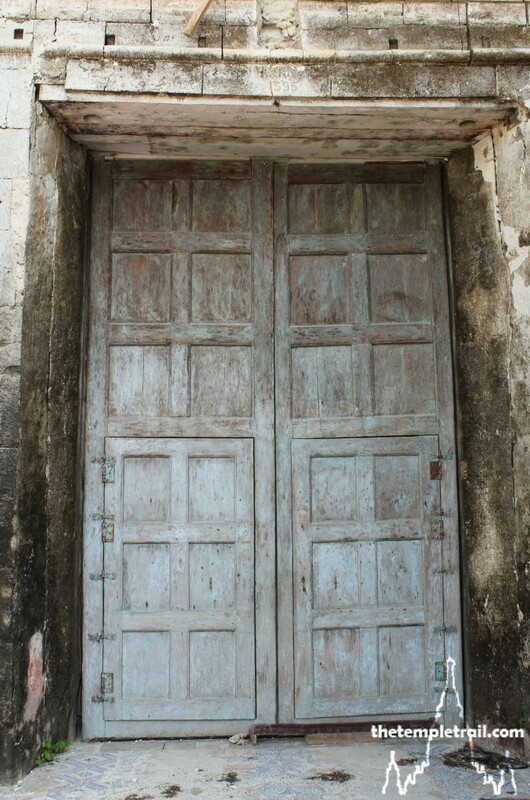 A large wooden retablo (reredos) marks your entry as you walk more fully into the chamber. You make your way as far down the nave as you can, before being blocked by a rope. Looking down the church nave, you see detritus and rubble on the floor where it was shaken free from the ceiling. The earthquake was somehow not as effective here as it was on the façade and you could be forgiven for not realizing that it happened. 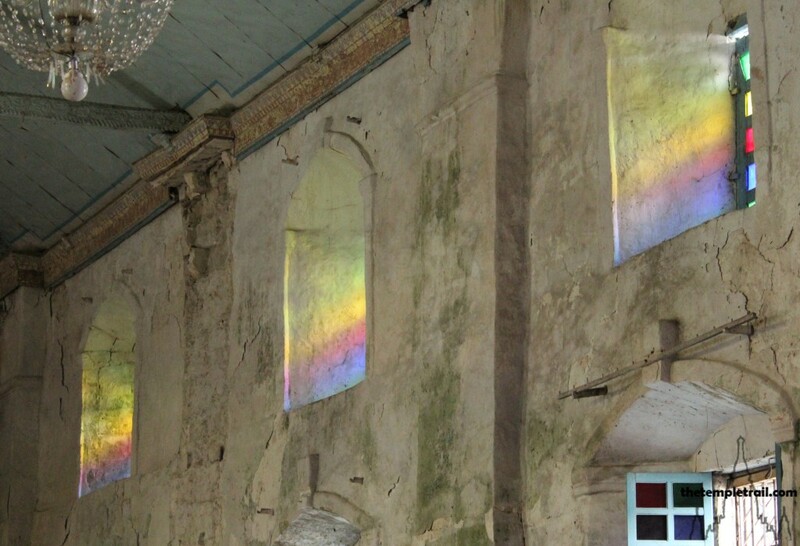 Rainbow lights penetrate the chamber through the multi-coloured windows. The feel of the church is otherworldly as you explore it further. On the wall to your left is an old and fragile pulpit. The stand looks almost as if it is trying to pull away from the wall. Above the box is a crowning canopy that acted much like a speaker to amplify the priest’s voice as he preached to the masses. The pulpit has clearly been out of use for years, but not so the tribuna (boxed balcony), that hangs off the wall just above the crown. Although out of bounds to you today, prior to the earthquake it was accessible. In the formative days of the church in Baclayon, the wealthy and important congregation members did not wish to mingle with the crowds during mass. The tribuna was built so they could worship in private during services. The social elite would have been hidden behind the wooden screen, while looking out directly on the mass through small lattice windows. Like at the opera, this box was one of the best seats in the house. Some of the other dignitaries had their own seating in the main part of the church, marked with the rank of their office. Crowns adorned the chairs of royal officials, inkwells for administrative officers and other insignia for the military. Others such as a goat tied to a tree are more cryptic, whereas the one depicting a man in stocks was clearly reserved for police officers. The local people were consigned to standing at the back of the congregation. The church, until the earthquake stopped mass being held inside, was more egalitarian after the Spanish left. Ordinary pews allow for any and all to sit where they please. Turning to face the sanctuary, you see before you an array of three Baroque retablos. 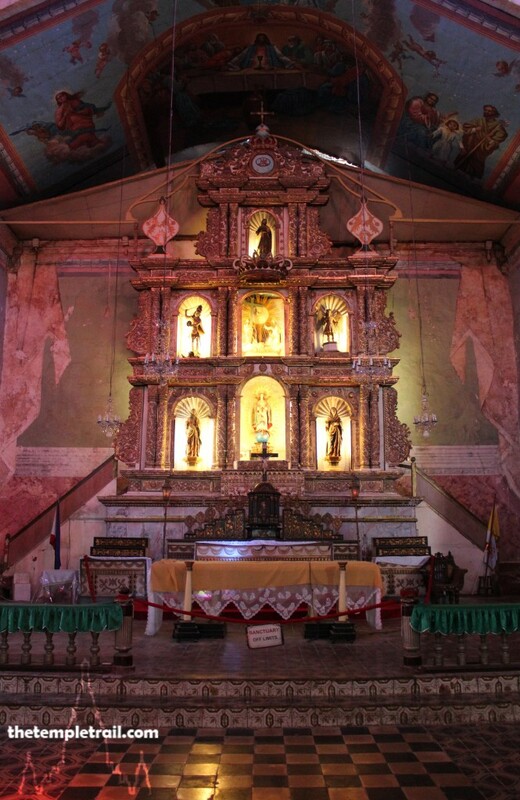 The retablo in the right transept is ornate, but time-worn. The white, green and gold shrine holds Augustinian saints and was installed by the Recollects, when they added the transepts to the building. Around the central virgin are Saint Augustine, his mother Saint Monica and Saint Nicholas of Tolentino. Gazing at these priestly saints for a while, you see how the Augustinian Recollects, despite being a less missionary work interested order, really made the church at Baclayon their own. Crossing to the left transept, you view the balancing retablo on that side. This one in the same style, holds saints that have more practical powers for the devotees of the church. Saint Lucy, who governs eye problems, Saint Blaise, for throat issues and Saint Anthony of Padua, who assists with lost items, are housed in the more domestically useful retablo. As you return to the centre of the church, you look up at the large central retablo in the sanctuary. The platform is roped-off, but you are close enough to see clearly. 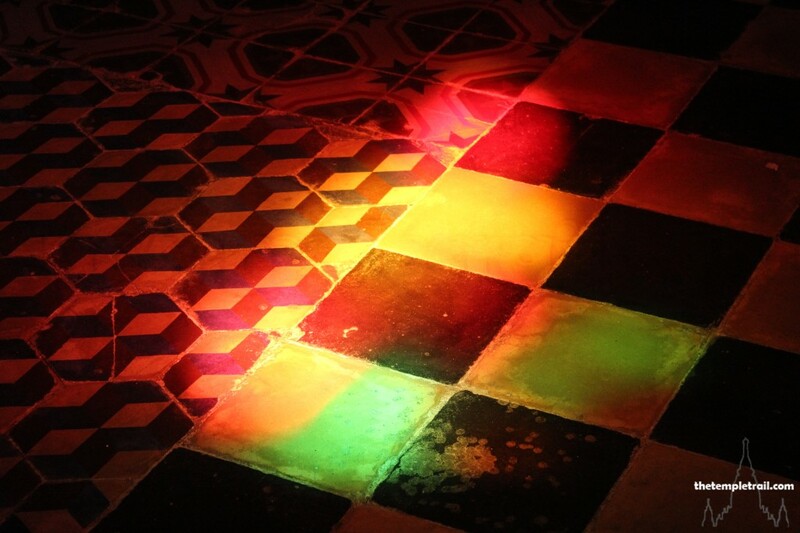 The rainbow light from the windows illuminates the 19th century flooring. While most of the church uses native baldosa tiles, here you stand on the more decorative azulejo tiles that were brought from Mexico and Spain. The lighting also eerily frames the central retablo. This is the original that was installed by the Jesuits. Their mark remains in two discs on either side of the crown of the retablo, that bear their motto Ad majorem Dei gloriam (To the greater glory of God). The statues inside trace their origins to the Recollects, but are of who you would expect. The Virgin; Our Lady of the Immaculate Conception is the central image and is surrounded by the Archangels Michael and Gabriel, the Holy Trinity and Saint Joseph. Above the sanctuary is some of the only painted ceiling in the church. The once richly painted ceiling deteriorated in the tropical climate, so it now remains mostly blank, with the exception of the work done in the 1950s by local artist Max Aya-ay. While he was originally to restore the whole ceiling, it was quickly noticed that the pigments were wrong in composition and tone, so the project was abandoned. Aya-ay’s work is of the last supper and its bright hues cordon off the area directly above the sanctuary. The only other work above you circles the dome. The evangelists (Matthew, Mark, Luke and John) occupy the ordinal directions, while between them are the words Ave Maria purisima, sin pecado concebida (Hail purest Mary, conceived without sin). After a few more moments in the spectrum of light, you return to the entrance of the church. 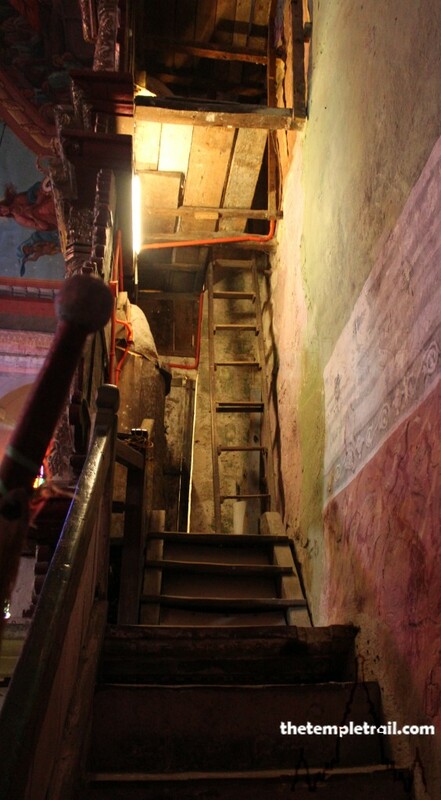 Passing the central retablo, you look up the crooked stairs that climb the ancient structure. 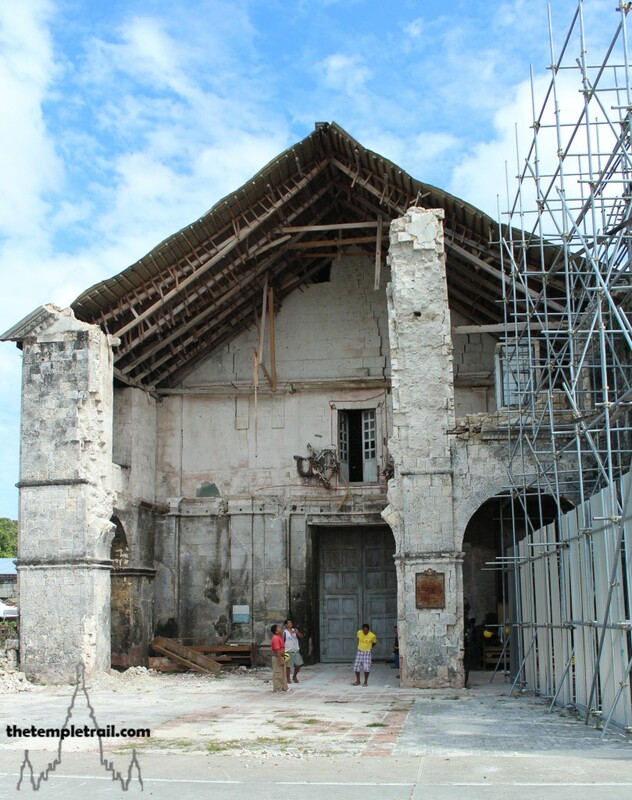 The whole thing looks as if it would come crashing down with the slightest breeze, yet it has withstood a powerful earthquake that reduced many of the churches of Bohol to rubble. Walking out to the back of the church and appreciating the gardens, there is a peace to the site, despite the recent calamity. Dropping a few more pesos into the collection box as you leave, you know that within no time the church will be back to normal and greeting the faithful as it has for hundreds of years. Hi is there a complete list of priests who had served in Baclayon Catholic cathedral. My interest in this is due to my father being the grandson of a priest with the last name Guyot the father of my grandfather Nemesio Guyot. My grandmother was not married to him; he was son of a priest named Guyot in Baclayon. My father was christened with my grandma’s surname Manuel Arreza Rodriguez born in Cantilan Surigao where Nemesio Guyot was high school teacher of my grandmother at that time. She was half-Portuguese, second generation Spanish as well. I don’t know if this is helpful, but it’s all I have. I’m spécialized in restoration to historic monument in Paris, France, since 25years, and i want to work in Philippines in this job, to give my experience to the old monuments in Philippines. How can i do to find the right contacts to propose my service ? I will pass on your details to someone that I know. They may be able to help you find contacts, but I can’t guarantee it. I sent you an email. I hope it works out for you.